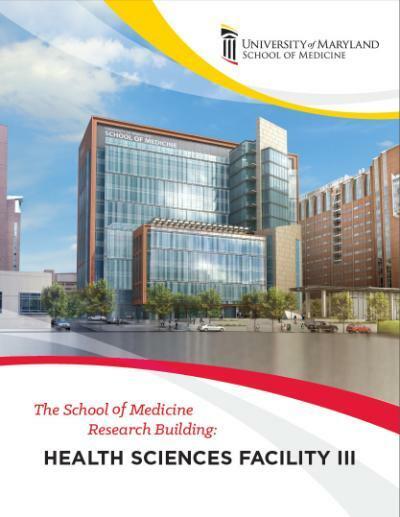 The University of Maryland School of Medicine is regarded as one of the world’s leading centers for discovery-based medicine, education, and patient care — and with good reason. The very history of medical education itself is enshrined on our campus. Our school has more than 1,400 full-time faculty researchers, whose work focuses on new technologies and scientific discoveries, and nearly 1,000 faculty physicians provide care not only in Baltimore but throughout Maryland and the world. However, we must seek additional resources to address maintenance needs across campus and support current and new facilities that will provide the staging ground for future success. We need financial investments to refresh, restore, and renovate the spaces in which we work, to preserve our past and continue providing extraordinary care for generations to come. 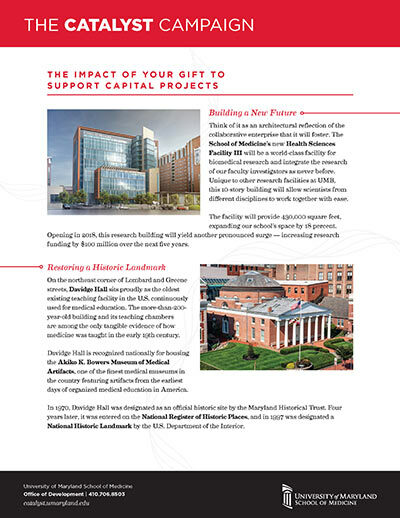 Your gifts support groundbreaking projects, like the Health Sciences Research Facility III, our first new research building since 2003, and restoration of Davidge Hall, the oldest existing teaching facility in America continuously used for medical education, critically in need of new mechanical and electrical systems. Think of it as an architectural reflection of the collaborative enterprise that it will foster. The School of Medicine’s new Health Sciences Research Facility III is a world-class facility for biomedical research integrating the research of our faculty investigators as never before. 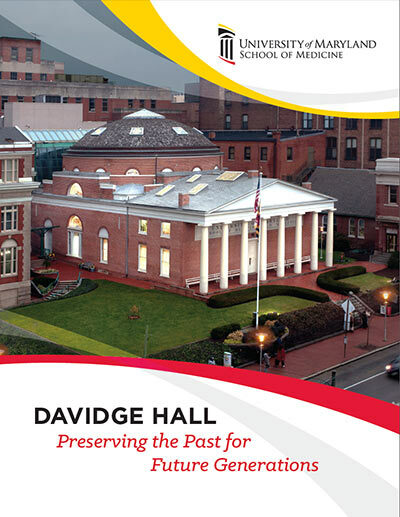 Davidge Hall has been in constant use as a medical educational facility for more than 200 years and has survived with a remarkable amount of its original building fabric intact. By making a gift to support this renovation project, you will demonstrate the importance of preserving this iconic building so that we may continue to use it to teach future generations of aspiring physicians.